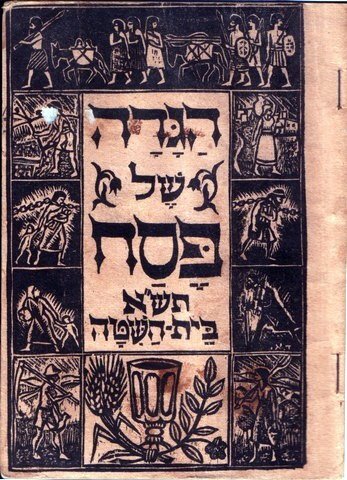 Back in July I posted some thoughts on the National Library’s final event of the series “נפגשים בבבלי”. I wrote how I was pleasantly surprised to see that the event did not uncomplicatedly celebrate the new place of the Talmud in Israeli society, rather it satirized it, problematized it, and productively questioned it. What follows are some sharp thoughts in that vein by the blog’s resident cultural critic– S.S.
1. Perhaps more than any other Jewish ritual, the Passover Seder functions as a particularly efficient ideological apparatus. The Seder is one of the rituals through which Jews reconfirm their Jewish identity. For lots of Jews who rarely go to a synagogue and hardly know what the Talmud is, this evening is one of the only moments in which they enact their Jewishness not through their presence in a ceremony governed by someone else, but by being active participants in a ceremony they conduct themselves. Thus, the Seder helps to constitute them as Jewish subjects. But who is this subject? Who are the readers that the textual and ritual procedures of the Seder suppose? What kind of effect should the Seder produce in me, as a non-observant Jew? What do I become by reading the text of the Haggadah, by following its orders, obeying its law? These questions become even more acute when there are non-Jews around the table, as is often my case – where are they vis-à-vis the subject whose existence the ritual seems to assume and to form? 2. I think that for many Israeli Jews today, Pesach and Yom Kippur are the two most significant “Jewish” moments of the year. Both holidays impose a series of restrictions on daily life, followed at least in part also by Jews who do not consider themselves “religious.” And then there is also the ritualistic part of the holidays. In Yom Kippur the ritual happens in the synagogue. For many Jews it is the only time of the year they visit one. They follow the prayer, and try to get what they can from the old Hebrew texts, but their participation in the ritual is rather limited. The responsibility is not on their shoulders but on the chazan or the rabbi. In Pesach, however, the ritual is conducted at home. There is no rabbi or any other religious authority to monitor it and to verify that everything is going on as it should. There is only a text, the Haggadah, which is also a manual. It is the only exterior agent of Jewish discourse, and the participants are supposed to play their part in the mise-en-scène put by it. The text of the Haggadah celebrates the liberation and the birth of the nation. We were slaves, and now we are free. This message is being conveyed by the words of the text, but also by the ritual whose components have a strong symbolic value. A ritual, in order to be effective, cannot be fully comprehensible. That is why sometimes the Haggadah explains the symbolic value of the ritual (as in the case of pesach, matzah and maror) and sometimes not (the covering of the matzot for example). The mystery of the ritual reflects and enacts the mystery of the miraculous salvation. 3. Every year before the Seder I try to look in tractate Pesahim for stories or sayings to discuss around the Seder table, and I am always surprised to notice how little this voluminous tractate has to offer in this regard. The Seder is practically the only part of the holiday that I practice. In other words, most of the tractate is dedicated to laws that I simply don’t follow. And then a very large part of it deals with the Pesach sacrifice, i.e. a ritual that even the most observant Jews cannot practice. Obviously, to the people behind the tractate in the Mishnah, Tosefta and both Talmuds, the holiday meant something quite different than it does to me. The talmudic tractate dedicated to the holiday doesn’t seem to ask the questions that I, as a secular Jew, am interested in. It doesn’t have the same problems. A comparison of the talmudic tractate with the Haggadah accentuates the distinctive character of each one of them. In the terms of Robert Cover, both texts relate to the same normative world in two different ways: the Haggadah creates it while the tractate maintains it. The two texts speak two different languages. The Haggadah is much closer to what Cover calls the “paideic pattern”; more than developing a coercive legal system it works on the subjective attachment to it. Its focus or subject matter is not the law, but the formation of a world in which this law would have a meaning. The talmudic tractate, on the other hand, corresponds to Covers’ “imperial pattern,” in which “norms are universal and enforced by institutions.” Whether or not these institutions actually existed outside the text in the time of its elaboration is not the question here. What matters is that tractate Pesachim supposes an already attached public, therefore it doesn’t speak the language of attachment. Since I am not the “normative” Jewish subject the tractate seems to suppose, I will not be able to find in it answers to my questions. I question my attachment to the Jewish normative world, whereas the tractate speaks the language of an already-established and unquestioned authority. It assumes that its readers have already come to terms with the place that the normative rabbinic discourse has prescribed for them. 4. This personal conclusion serves me as a good reminder of the limits of the knowledge I can expect to find in different Jewish texts, first as a Jew trying to figure out the meaning of his Jewishness, and then as a scholar of rabbinics who believes in the universal meaningfulness of the talmudic texts. It is precisely when I try to articulate the meaning I can give to the normative world of Jewish law that I need to remember that the Talmud is not the best place to look. I need to search for answers outside it, in texts that do not assume an already existing attachment to the halakhic or talmudic discourse. The Haggadah is such a text. If the reader understands the text and responds to it, he or she is constituting her/himself, at least for the time of the Seder, as a subject of Jewish-rabbinic discourse. But how many readers like that exist today? For many readers of the Haggadah the “rabbinic” part of it is simply not relevant, just like the normative world it represents. They don’t see themselves subjected to rabbinic authority and they are not familiar with its language. They don’t understand the rabbinic game. The “rabbinic” part of the Haggadah is only rarely understood by them (thus, for example, the series of midrashim on the number of the plagues is read as a bizarre text because there’s no one present to give them the midrashic key). The Jewish part of the call is much easier to hear. I don’t even have to fully understand the text in order to respond to it, all I need to know is that it is a Jewish text, that should be read by Jews, and that I, as a Jew, read it. This is enough to remind me of my Jewishness. And once you read it, it is more or less understood. The game is easier to play – I lift the mazza, I break it, hide it, read something, drink, sing…. all in all a nice and festive ritual, with good food and wine. It is indeed a Jewish symposium. Baruch Bokser, in his brilliant attempt to find the rabbinic meaning of the Seder, talked about the ancient rabbis’ tentative to eliminate the parallels between the Seder and the “symposiac practices.” It is not surprising therefore that for Jews who are not “rabbinic” the “symposiac” (Dionysian?) character of the Seder raises its head and seem to take more place than the discursive part (or in other words – less talk more eat). The festive dimension of this kind of Seder should not lead us to think that it is meaningless. On the contrary, its meaning for the participants is so basic it is practically irresistible: you are a part of the Jewish people since you share a history. It is not necessarily the mythical history of Exodus, or rabbinic crafted version of the Haggadah, but rather the simple participation in the ancient ritual. For non-observant Jews, the Seder is one of the very few significant moments in which they participate in Jewish history and thus reaffirm their Jewishness. But since it is a ritualistic rather than a discursive moment, the category of Jewishness – what does it mean to be a Jew? – stays more or less empty. I started by saying that the Seder is an ideological apparatus that participates in the constitution of the Jewish subject. But if you try to look at the way this apparatus functions in many Jewish households today, you realize that the Jewishness it constitutes is devoid of substantial meaning. It is a name behind which there is not much content. The Chazon Ish saw it clearly when he referred to the Israeli secular Jews as the “empty cart.” He considered that without the halakhic normative world, the Jewish identity is merely a tag. What he also saw is that precisely because it is merely a tag, it can be easily manipulated. By waving the Jewish card he persuaded Ben-Gurion to make concessions that the secular founder of the Jewish State was not ready to make beforehand. In that respect, many other Israeli politicians are loyal followers of the Chazon Ish: Whether they are religious or not, they justify their actions and try to gain more political support by addressing the Jewishness of the Israeli citizen. It is precisely because this Jewishness is an empty sign, as is manifested perfectly around the average Israeli Seder table, that many Israelis Jews today respond almost blindly to their call.